Correspondence from Utah Roads Committee Representative, O.G. 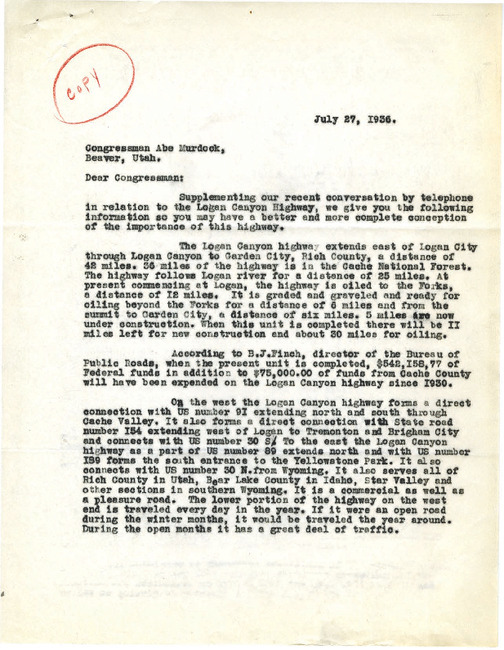 Cardon to Utah Congressman Abe Murdock concerning the state of Highway 89 in Logan Canyon, the Roads Committee's contention that money needed for Logan Canyon roads was needlessly diverted to work on southern Utah roads, and a desire that construction and oiling Highway 89 through Logan Canyon proceed as soon as possible. Governor (1933-1941 : Blood), “Correspondence from O.G. 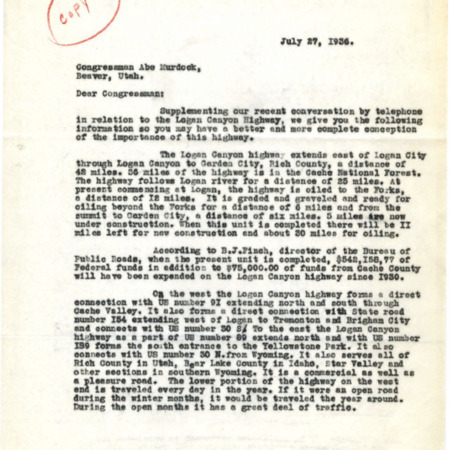 Cardon to Abe Murdock, July 27, 1936,” Highway 89, accessed April 22, 2019, http://highway89.org/items/show/10242.